I hope you are having a great Summer. For us in the UK the weather has not been too brilliant and I have attended some rather soggy fundraising events! We fundraisers are an intrepid bunch however and damp weather certainly did not seem to dampen enthusiasm for all sorts of good causes. Hopefully plenty of sunshine to come. As well as visiting lots of fetes and fairs looking for interesting ideas to add to the website I have also been very busy with my other job. Away from the world of fundraising I also do some work for a Human Rights Organisation. We have been undertaking a lot of work around migrant workers employed in garment factories around the world, trying to promote better working conditions and fair wages etc. This work saw me recently helping organise a conference in Dhaka Bangladesh which was fantastically interesting if exhausting. Fortunately we were looked after admirably by a number of small Bangladeshi non-governmental organisations, charities and support groups. I was struck, as I always am, by the passion, enthusiasm and drive of all these groups and the people who give so much of themselves for causes that they believe in. In particular I met a number of very dynamic women, working women with kids and extended families to worry about but still working tirelessly for their groups. Its always both humbling and inspiring. One particular incident at the event made me smile however. We had seated around a table representatives from business's including many high street brands, government officials, trade unions, labour associations, Bangladeshi NGO's, Human Rights groups and migrant worker support organisations. My job is to organise the logistics and be front of house on the day, taking care of any problems and issues that arrive. I can never relax until everyone is in the room and the real work starts. Anyway I was in the middle of all this and jumped as my phone buzzed. Was that the Nike representative now unable to attend? Had a government speaker got caught in traffic? No….it was a friend from my school Parent Teachers Group confirming that the Splat the Rat stall for the summer fair had arrived! A life less ordinary and an incongruous mix but actually that is, of course, how many of us undertake our work with the small charities and groups we support. As an extra, something we do on the side, something we desperately fit in around our regular lives. At times these commitments can seem to get in the way, to take up a lot of time and worry in already stressful lives but I tell you what…….I wouldn't want to be without it and I bet you wouldn't either! By the way we raised £37.50 on the splat the rat! Saw this interesting variation on hoopla at a local fete. 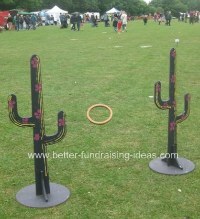 The cactus was cut from a sheet of hardboard and the stall was proving popular. It could however have been made even better. I reckon they should have really gone for the Wild West thing. If they had had some cowboy hats for the kids to wear while they had their turn and the stall-holder too in fancy dress it could have been so much more. Little extras like this cost little or nothing if you have a few props at home. They do however really add to the "sense of importance" of any stall and kids in particular love it. Its a small thing but it would make all the difference. Baked Beans Bath - Can you help? 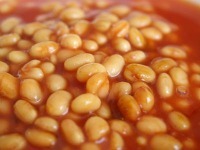 A renowned fundraiser is having a volunteer being sponsored to sit in a bath of baked beans. We would love to include this on the website but have tried in vain to find an organisation putting this on. If you know anyone who has ever done this or is about to do so please do get in touch and let us know. Volunteers are the life blood of a great many small groups and charities. They often are the ones providing the ideas, the labour and the enthusiasm that allow so many organisations to survive and thrive. Either that or they are the people relied upon to undertake much of the actual work of the organisation. Volunteers are also often at the forefront of fundraising activities raising money and attracting new supporters or publicity to the cause. There is no doubt that many charity groups owe everything to their volunteer supporters The dilemma is how best to show your appreciation without inappropriately using up hard earned funds. Here are some simple ways to say thank you that won't cost your organisation a penny. 1. 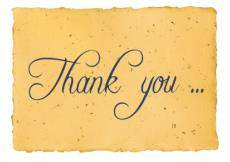 Personalised thank you from your organisations chief executive, or board members (or headmaster in the case of school groups) This is so simple that it is often overlooked. A note, card, personal email, phone call or quiet word of thanks on the day of a fundraising event really will make a difference to your supporters. 2. A thank you from the end users For some organisations there are very obvious end users of the services provided by your group. These might be youth or community groups, hostels etc. A letter of gratitude either from a club or centre manager would be great but even better are when such thank you come from the final recipients. This is true in particular for youth activities. Thank you letters from kids do not need to be long and photos are a quick and easy but great way of showing what a volunteer's hard work has helped to achieve. 3. A mention in the organisation annual report Many organisations produce an annual report or summary of work to date. What a great place to thank key supporters and volunteers. Another good idea is to simply list all those who have taken part in your work or fundraisers over the past year. 4. Entry into a prize draw This is really popular with volunteers and a great way of team building. Every so often or after any particularly "well staffed" event you put all the volunteers names into a hat for a draw for a very simple or comedy prize. Have a bit of fun with this and make a big thing of the winner. All of the above ideas are easy to implement and cost nothing apart from a little time. Taking the time out to acknowledge the unique contribution hard working volunteers and supporters make is very important. A simple case of remembering to say Thank You! 4tbls Honey (and maybe a bit more! Put the sugar, evaporated milk and water in your largest saucepan ( you need to allow plenty of room as the mixture bubble up). place over a low heat and stir until the sugar has dissolved. Then stir in the salt and honey. Raise the heat and bring the syrup you have created to a fierce bubbling boil. Stir frequently. If you have a sugar or jam thermometer you need to get up to 116 C.
Turn off the heat and allow the mixture to cool slightly. Cut the butter into 5 or 6 pieces and drop them into the syrup mixture. As you do so stir vigorously with a wooden spoon. The butter will melt into the syrup as it thickens. The mixture will begin to become grainy. Turn the mixture quickly into the oiled tin. 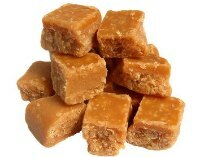 The fudge will now begin to set. Before it sets completely mark and half cut into squares. When it is completely cool this should make it easier to cut properly into small neat squares of fudge. Do you have a bake sale favourite? Send the recipe in to us and we will try to include it either on the web site or in a future edition of Better Fundraiser. Take Care and we hope you continue to have a great summer of fundraising success.